Are you ready to learn more about conversions, but not sure where to begin? We have you covered in this post – catch up on the latest and greatest information in this list of over 50 awesome posts on conversions from 2011. There’s something for everyone, from blogging to social media, landing pages to squeeze pages, increasing conversions vs. conversion killers, design, and more! Read these blog posts and start converting more visitors into paying customers. A Beginner’s Guide to Successful Conversion – Converting visitors into valuable users is arguably the most fundamental element of managing a website. The author takes a closer look at conversion, discussing what it is, covering some common pitfalls, and tackling how to improve your site’s conversion rates. Clicking Me Softly: A 5-Day Crash Course in Conversion – Explore the ideas, tools and methodology necessary to maximize the efficacy of your customer’s life on the page which will make your pages better, more focused, more persuasive and ultimately more successful. The Debate of Web Sidebar Design and Conversions – Whether or not sidebar design hurts conversions has to do with what you define as a conversion and your overall conversion goals. The Ultimate Guide to Increasing Blog Conversion Rates – Seven conversion site reviews with over three hours of conversion consulting that will show you how to increase blog conversion rates without messing around with any of that “tech” stuff. The Simple Anatomy of a Conversion-Optimized Blog – Carefully crafted blog posts can do wonders for your lead generation efforts. You just have to know how to do it right. The author walks you through the anatomy of a smart, lead gen-optimized blog post so you can start converting that blog traffic into precious leads. Luckily, it’s far from complicated. Blog Conversion Rates: How a Few Simple Tweaks can Increase your Blogging Revenue – Diving into the concept of the Most Wanted Response – identifying the action you want people to take and using blog design to achieve this goal. 8 Conversion Rate Optimization Tips for Bloggers – While the author doesn’t pretend to have all of the answers, here are 8 CRO (Conversion Rate Optimization) tips he has learned that can help you increase your blogging conversion rates dramatically. 5,867 Words on Becoming a Conversion Machine: A Guide for Bloggers – The top three tips you should implement now plus 17 more tweaks to help grow your blog conversions. Are You Making These 3 Common Conversion Testing Mistakes With Your Sales Copy – It is about using time tested sales methods that work. And time tested sales methods will work in your niche, sometimes they just have to be tweaked a bit. That is why the author recommends testing while avoiding these common mistakes. Post-Click Copywriting Tips for Higher Conversions – Once you get visitors on your page, learn how to get persuasive, get creative, and get optimized for conversions. eBook Case Study: How Important is Sales Page Conversion Rate – In this case study, the author compares the sales performance of two real eBooks and identifies conversion tactics that made the difference in sales between the two of them. How I Improved My Sales Page and Increased Conversion Rates for My E-Book – Learn how to sell more information products with a high-quality, hype-free sales page that stresses the benefits of your eBook or other infoproduct. Conversion Psychology #1: Why Stealing Grapes is Good for Your Form Conversions – Learn how the psychology of stealing grapes provides a conversion lesson for providing visitors with a report preview on your lead capture forms. 29 Conversion Optimization Testing Case Studies – and Counting – These client-approved case studies cover BtoB and Consumer Marketing as well as eCommerce and Lead-generation. They include a very wide range of industries and calls-to-action, from High Tech software to Catalogue and single-product eCommerce retail; Tourism, Travel and Hospitality; Financial Services; Affiliate marketing; Video Games; and even hair restoration services and alcohol and drug addiction recovery! Private Community Generates 680% Sales Conversion Increase – Prospects that interact with the community after abandoning a lead form showed a 680% improvement in ultimately signing up for a debt relief plan and a 732% improvement in making their first payment, when compared to those who did not interact with the community. How Messaging and Design Affect Conversion Rates – The examples presented in this infographic should be used to inspire thought, but more importantly to remind you of the importance of testing, and that you should employ a process for conversion rate optimization. The Good Advice That Killed My Conversion Rate – The author asked some very talented and very successful people for advice on how my pages might convert better and experimented using this advice. The results were shocking, weird and entirely unexpected. It’s a simple, but extremely valuable lesson that I think you can benefit from. 5 Landing Page Mistakes that Crush Conversion Rates – Five of the most common mistakes people make with their landing pages. More importantly, the author tells you how to avoid making them yourself. Why über-Optimised SEO Titles Kill Click-Throughs & Conversion Rates – Optimizing Title and Description Meta tags is one of the cornerstones of successful SEO. BUT if you’re designing your tags only to achieve a top SERP position the end result might actually be less traffic to your site. Why? Because when meta tags are optimized for ranking position you often sacrifice an effective call-to-action and your click-through rates will suffer as a result. 12 Conversion Boo-Boos That Make Your Website Stink – The author talks about the conversion boo-boos marketers often commit. In doing so, she hopes to make you become aware of the many ingenious ways Internet marketers make our prospects bounce, get turned off, not buy and cast us into complete oblivion. Speed Is A Killer – Why Decreasing Page Load Time Can Drastically Increase Conversions – Can the speed of your website really have that much of an effect on your sales? Even if your site isn’t loading too slowly, can it still be improved? And how does Google factor into all of this? You might be surprised. 10 Little Known Factors that Affect Your Conversion Rate – If you aren’t seeing the gains you’d hoped for, there still may be some underlying issues nibbling away at your conversion rate. Here are 10 little-known factors that could be eating away at your successes – and how to fix them immediately. The #1 Conversion Killer In Your Web Design – There’s one web design mistake that absolutely tanks your conversion rates, and once you cure it, you could propel the lead generation / sales ability of your website by as much as 100% or more. 7 Free Tools By Google To Increase Your Traffic And Conversion – Some products offered by Google are so amazing and useful that other companies charge for products that deliver the same result. In this post the author highlights products by Google that are designed specifically for webmasters or online entrepreneurs looking to increase traffic and conversions. 10 Ways to Use QR Codes for Better Conversion Rates – From building loyalty and generating sales to capturing customer feedback and boosting local SEO, check out the ways 2D barcodes like QR code and Microsoft Tag can improve conversion rates and help achieve your business goals. How to Increase Conversions With Google Website Optimizer – Google Website Optimizer is a great tool you can use to increase email opt in conversions. It’s surprisingly easy to use and produces great feedback, graphs, charts, and results. Use (Free) Traditional Conversion Tracking For Detailed Social Media Analytics – How do we get to the numbers on social media engagement which actually enable us to track the customer engagement cycle from awareness through purchase and beyond? With these easy and free tools you can roll your own social media analytics package to track real leads. 8 Tips to Boost Your Business Website’s Conversion Rate – The eight tips below won’t exponentially increase clicks to your website or push it to the top of search results. However, they will help make the most of traffic that comes your way, which is often more important than quantity. These eight tactics will help turn visitors into customers, drastically increasing your website’s conversion rate. 7 Fast Fixes to Increase Your Website’s Conversion Rate – The author makes things simple and gives you 7 easy tips that, if you apply to your sales process, will surely help improve your conversion rates. The 5 Keys to Conversion Rate Optimization – One of the quickest ways to improve ROI from search campaigns is to improve conversion rates from current traffic. Even a 0.5-1 percent conversion rate increase can have dramatic results in the overall health of a company. Below are the top five ways to improve conversion rates for organic and paid landing pages. Unconventional Opportunities For Conversion Rate Optimization – Five often ignored opportunities that you can exploit to see a boost in conversion rate. 5 Easy Things You Can Do to Improve Website Conversions Right Now – While you will always want to measure the impact of page changes on conversion rates by comparing data before and after those changes have been made, there are a number of measures you can undertake with relative safety that are almost certain to improve how many visitors complete a website goal. How To Increase Conversions For Organic Keywords – In Google Analytics, you should have either some important (non-ecommerce) conversion Goals being tracked or e-commerce turned on and set up so that it is tracking transactions. You’ll then be able to see the conversion rates by keyword. 10 Ways to Increase Conversions on Mobile App Landing Pages – Learn about the architecture and design of 10 important elements of a successful mobile app landing page and how they can impact your conversion rate. Squeeze Page Optimization: How to Get 700+ Free Leads and a 64% Conversion Rate – How a non-traditional squeeze page led to great results. How 5 Popular Landing Page Optimization Tips Can Also Hurt Conversion Rates – What most marketers won’t tell you, however, is that landing page optimization can be a double-edged sword; immediate improvements in micro conversions high up the funnel may result in lower overall prospect quality. 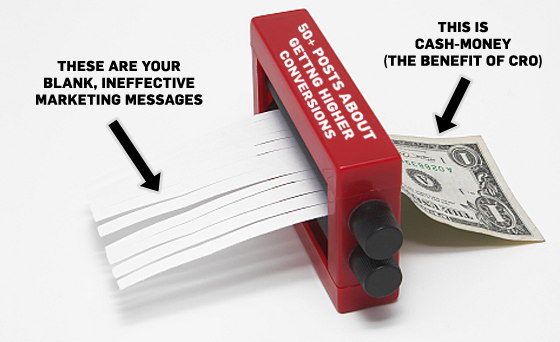 Consider the pitfalls of some of the most popular conversion-optimizing tips. What Should You Test On Your Landing Pages For Maximum Conversions – Learn what types of tests to run (A/B vs. Multivariate), how to chose the strongest converting pages first, and why you should take a radical departure from the norm. Micro Conversions: The Key to Maximum Lifetime Customer Value – Understanding micro conversions is part of the process of understanding why the vast majority of your customers walk away from your site without doing anything. While you may be focused on trying to increase your 2% conversion rate, there is a more holistic view you can take on conversion that will help Improve your website and business. Should You Optimize for Micro-Conversions – Should you run micro-conversion optimization tests to improve your results? Conversion testing expert, Chris Goward, discusses how to set testing goals and when to use micro-conversions. Your Social Media Avatar and Conversion – How to make your social media avatar or profile picture lead to more conversions. Measuring Social Media ROI & Goal Conversions with Google Analytics 5 – Learn how to use Google Analytics 5 to measure social media ROI and the relationship between social media referral traffic and conversions. Social Media Marketing – An Interview with Tamar Weinberg – Tamar discusses social media marketing, metrics, conversion, branding and development of a personal social style. Cost Per Like Campaigns On FaceBook: The CTR, Conversion Rate, Reach Tradeoff – Here are some conversion tips if you are building or plan to build a like acquisition campaign on FaceBook. 7 Approaches To Engagement Conversion, 5 Explicit Tactics For Twitter & FaceBook – The seven general approaches (and most important things to remember) when integrating social conversions into your website. What Can Social Media Teach Us About Conversion Optimization – Can conversion optimization also learn something from social media marketing? The answer is yes. In particular, one key lesson: people prefer dealing with other real people. How to Track Social Conversions on Landing Pages – While many people include social sharing buttons on their pages, few of them track their usage. But to optimize something, you need to measure it. The author shows you how in this post. How to Really Get Conversions from Social Media – Here, the author goes into the techniques and knowledge that you’ll need to take what you already have in social media (even if you have nothing going yet) and turn it into a converting machine for your business. Mobile Apps: Design for Mobile Conversion – Make sure mobile devices like the iPhone, Android and iPad easily use your online store. All are touch screen dependent which is an important item to consider when looking to develop a mobile version of your website. Besides utilizing this technology, here are a few key things to keep in mind when designing for a mobile device. Designing Websites to Increase Traffic and Conversion – Businesses should focus on the needs of the customers through analyzing the following areas as part of their online marketing strategy. How Images Improve or Destroy Conversion Rates – When you use images on your site, two things can happen: Images can either help you achieve your business goals, or hurt. Until you learn the subtle nuances of how images affect people, you’re standing in front of a firing squad wearing a blind fold. These are just a sampling of selections from my RSS subscriptions. So now it’s your turn – what have been your favorite posts this year about conversions and conversion rate optimization? Please share your favorites in the comments below!